Online storage that works just like your local drive, accessible from anywhere! DriveHQ takes the online storage service to a new level. You can drag and drop files / folders, directly edit a remote file and save it, or map a cloud drive. Business customers can use our Group Account service. You can allocate storage space to each sub-user, or create folders in your own account and share different folders to different sub-users with different permissions. It is very similar to multiple computers in a company managed by the IT department. Other online storage services such as Dropbox or Google Drive cannot match our features. For example, Both Dropbox and Google Drive offer a desktop client. 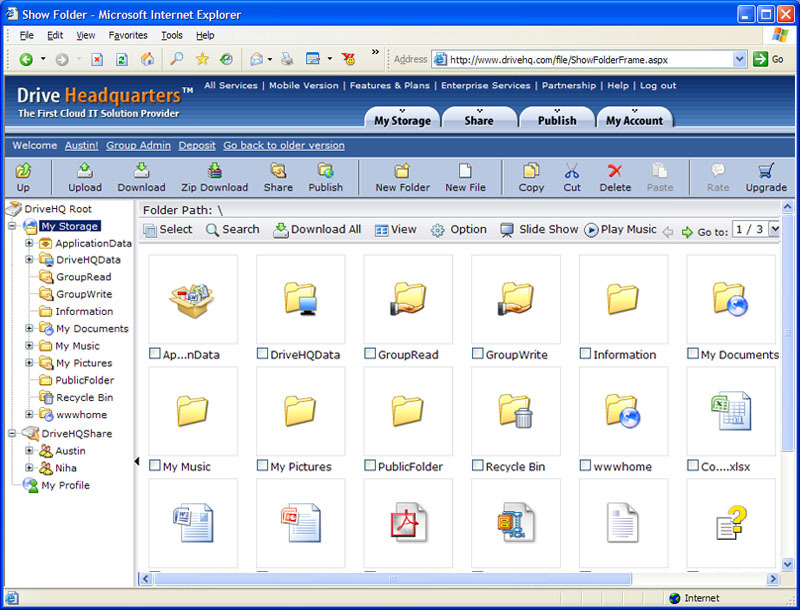 The desktop client creates a special folder on your PC, which is synchronized with your cloud storage. The weakness is very clear: If you want to access your cloud files using a desktop application, then all files must be sync-ed to the special folder on your PC. Otherwise, you must use a web browser to access your cloud files. When you have multiple computers, the data must be duplicated on every computer for efficient access. For a business with many computers and over 100GB of data, such a synchronized folder is very inefficient as it not only wastes storage space on each computer, but also unnecessarily uses a lot of bandwidth. With DriveHQ's FileManager or WebDAV drive mapping service, It is much more efficient than a sync-ed folder. (DriveHQ also has more advanced and efficient folder sync features than Dropbox). You cannot share large files by emails. Emails are usually limited to 10MB only. DriveHQ file sharing is designed to be extremely easy. Just select a folder and click on Share. You can share a folder to a non-DriveHQ user, or share different folders to different users with different permissions. With DriveHQ FileManager client, you don't need a USB drive, period! Unlike other cloud drives, DriveHQ FileManager never slows down or locks up your computer, even if your network is slow or unreliable! If you don't want to install any client software, we also have a version of FileManager that does not require installation, which can be used on shared computers / public computers. Drive mapping is also supported. While it is not as powerful as FileManager, it is the most straight-forward way of accessing cloud storage. You can create a group account for your family or company. The group account service is free and includes one free sub-user license. More user licenses can be ordered for only $0.5/user/month! With a group account, you can easily create and manage sub-accounts, sub-groups, set different user roles, allocate storage space and download bytes among group members, share different folders to different users with different permissions. You can synchronize any local folder with a remote folder; you can synchronize multiple folders on multiple PCs and multiple user accounts. Folders can be synchronized in real-time or scheduled times.